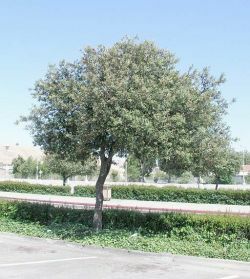 Comments: Broadleaf evergreen oak native to Mediterranean Spain, France and Italy. Dark olive green 1" ovate leaves, brown flowers, and small short acorns. At first glance, this tree looks remarkably like an olive tree, but the bark on the trunk and out to the smallest brances is dark gray to black. This is a small broad spreading tree with a mature height of 30' or less.